While excavating their West Loop industrial space, Old Fifth’s owners turned up a ceramic liquor bottle from the Prohibition Era. 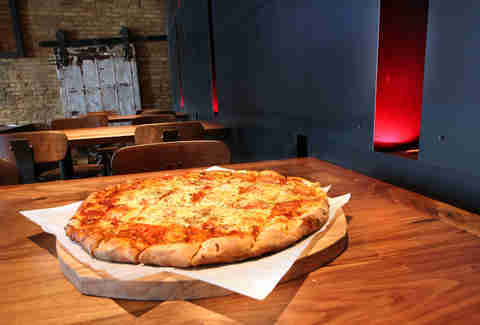 Now that’s gotta be kismet, as this wood-laden sports bar mere blocks from the United Center is smashing sobriety with more than 140 varieties of whiskey, then soaking it up with serious pizza courtesy of a Tru vet. 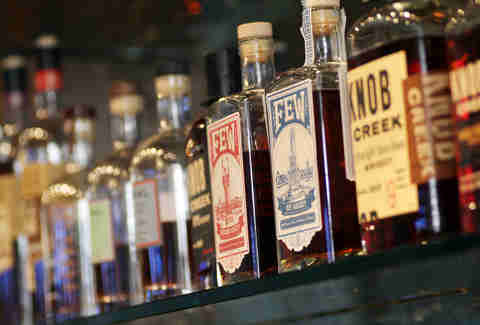 ... a variety of local favorites like Koval and Few, along with a dozen draft brews for a chaser. 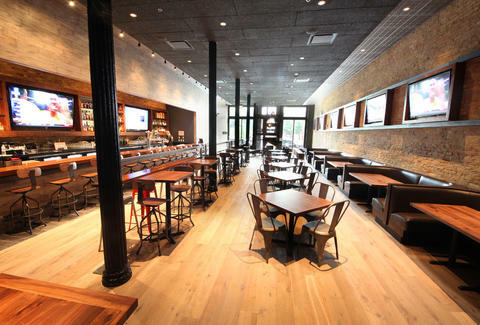 The shelves are flanked by a pair of 80in TVs with eight more flatscreens scattered between the bar and the entryway made from a mash-up of repurposed window frames, which is great, because it's so sad when window frames have no sense of purpose. 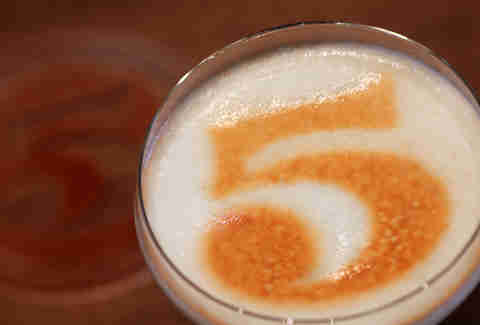 You may want to invoke the Old Fifth here, a whiskey (surprise!) 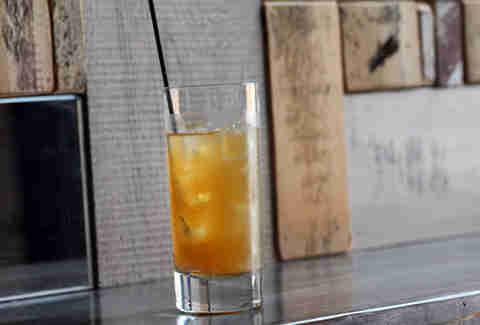 cocktail with walnut liqueur, apricot, lime, and Jamaican bitters. 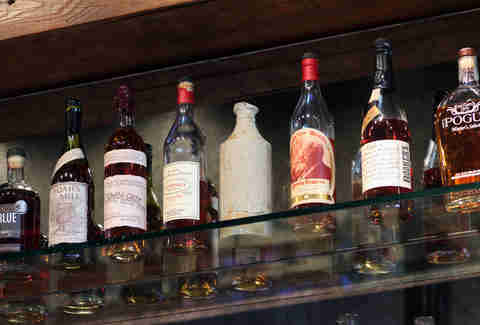 Assuming Clint Eastwood doesn’t barge in and shoot up the saloon (or start badgering all the chairs), the High Plains Drifter is another safe bourbon selection, with the Old Fifth logo stenciled on top using an aerosol can filled with bitters. 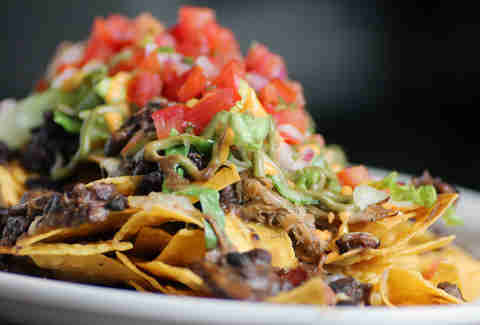 The innovative bar bites (again, the dude running the kitchen worked at Tru) include tater tots stuffed with brie & bacon, and these Brazilian nachos packed with pulled pork, cheddar & Chihuahua cheeses, black beans, and chipotle-lime sauce. 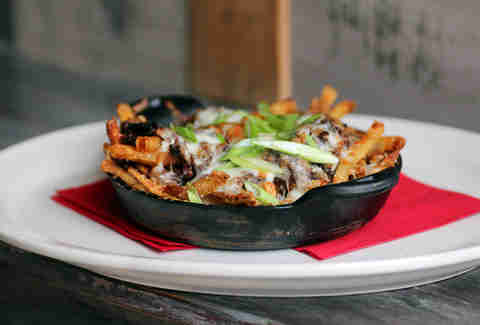 A useful tool for preventing you from reaching their same state, the loaded fries come in a cast-iron skillet loaded with white cheddar and braised oxtail. Because Chicago apparently hasn't innovated enough ways to make pizza bigger, this double-decker consists of two 16in pies stacked with a layer of pepperoni in between. If the wall starts glowing red, it’s not the Aggro Crag -- it’s the LED’s signifying it’s time to celebrate a Hawks victory with the same intensity that came with the end of Prohibition.